1 of 4 Heat grill or grill pan to medium-high heat. In a bowl, whisk together oil, vinegar, paprika, garlic powder and salt. Toss 2 tsp of the vinaigrette with shrimp. Thread shrimp onto 2 skewers. Set aside remaining vinaigrette. 2 of 4 Lightly coat peppers with oil. Grill on medium-high heat for 20 minutes, turning every 5 minutes. Transfer to a bowl and cover with plastic wrap to cool slightly. Peel and discard skins (its okay to leave a little on). Quarter peeled peppers, discarding stems and cores. Toss with remaining vinaigrette. 3 of 4 Grill the 4 chorizo halves 3 to 4 minutes per side. Slice into half-moons. Grill shrimp skewers 2 minutes per side, until cooked through. 4 of 4 Arrange pepper quarters on a large platter. 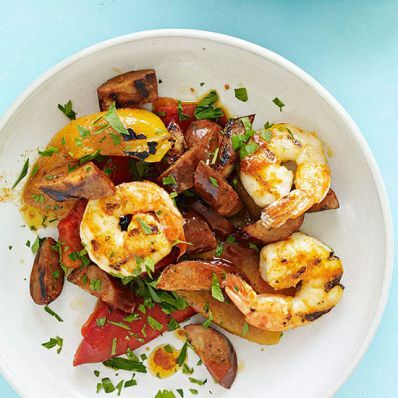 Scatter chorizo and shrimp on top, and drizzle with any residual vinaigrette. Garnish with chopped parsley, if desired.